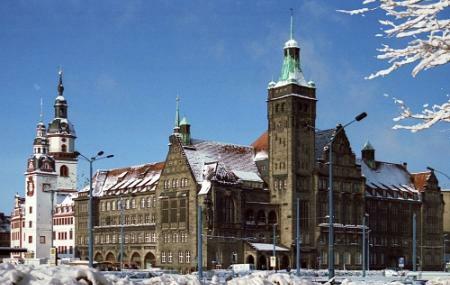 Das Chemnitzer Rathaus, or the Town Hall of Chemnitz is an old town hall building that has been renovated over the years and is today called the Double Town Hall. The town hall is called the Double Town Hall due to the presence of Old Town Hall and the later built New Town Hall. The Old Town Hall was built by the end of the 15th century and at the foot of this town hall are the half-figures of Judith and Lucretia and the magnificent Renaissance Portal. The Old Town Hall has undergone many restorations and renovations over the years. The New Town Hall on the other hand was built at the beginning of the 20th century. Designed by architect Richard Möbius, the New Town Hall reflects many elements of the Old Town Hall while blending harmoniously with it. How popular is Das Chemnitzer Rathaus? People normally club together Museum Fur Sachsische Fahrzeuge Chemnitz E.v. and Parkeisenbahn Chemnitz while planning their visit to Das Chemnitzer Rathaus. Well it's beautiful when the clock rings and sings. Didn't go in or find out if one could. Chemnitz is an exciting city ! Don’t get turned off by some media coverage . The city has a lot to offer . Tons of history , diverse architecture and friendly people . This is a pretty building that is in the heart of Chemnitz. This main square is the prettiest parts of Chemnitz. The other beautiful parts are the amazing rolling hills, nature and castles that are near by.